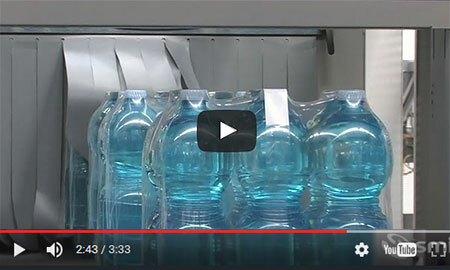 The SK ERGON packers can be equipped with an automatic handle applicator of the PSHA series (Pre-Shrinking Handle Applicator), which attaches a handle on a section of the shrink film before it's wrapped around a group of containers moving toward the shrink tunnel. packs are little, since the application before shrinking entails a larger section of application. The pre-shrinking handle applicator matches adhesive tape with a non-adhesive central support (a handle made of paper or plastic), thus composing an uninterrupted string of handles which, once wound on a reel, is loaded on automatically-locking mandrels to be then attached onto the heat-shrinking film surface. 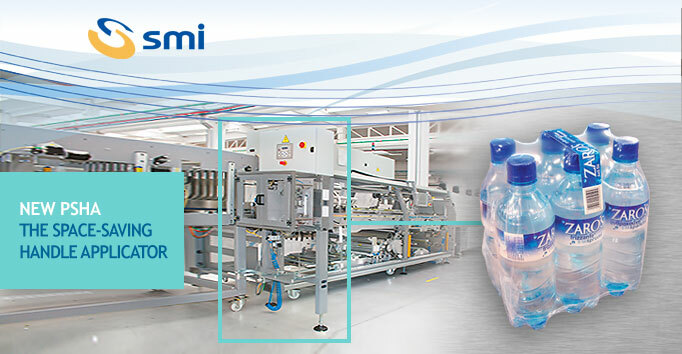 The PSHA handle applicator is perfectly synchronised with the packaging machine on which it is installed and this latter sets automatically in stand-by mode when the handle reel is used up. Moreover, the pre-shrinking handle applicator is outfitted with an operator panel enabling the direct adjustment of parameters, the memorization of a maximum of 10 formats, the real-time monitoring of the machine and the data transfer to the customer's control system by MODBUS TCP protocol on Ethernet network.